Not to be confused with Frederick E. Olmsted. Frederick Law Olmsted (April 26, 1822 – August 28, 1903) was an American landscape architect, journalist, social critic, and public administrator. He is popularly considered to be the father of American landscape architecture. Olmsted was famous for co-designing many well-known urban parks with his senior partner Calvert Vaux, including Central Park in New York City and Cadwalader Park in Trenton. John Charles, Charlotte, Owen, and Marion and Frederick Law Jr.
Other projects that Olmsted was involved in include the country's first and oldest coordinated system of public parks and parkways in Buffalo, New York; the country's oldest state park, the Niagara Reservation in Niagara Falls, New York; one of the first planned communities in the United States, Riverside, Illinois; Mount Royal Park in Montreal, Quebec; the Institute of Living in Hartford, Connecticut; the Emerald Necklace in Boston, Massachusetts; Highland Park in Rochester, New York; Thompson Park in Watertown, New York; Belle Isle Park, in the Detroit River for Detroit, Michigan; the Grand Necklace of Parks in Milwaukee, Wisconsin; Cherokee Park and entire parks and parkway system in Louisville, Kentucky; the 735-acre (297 ha) Forest Park in Springfield, Massachusetts, featuring America's first public "wading pool"; the George Washington Vanderbilt II Biltmore Estate in Asheville, North Carolina; the master plans for the University of California, Berkeley, the University of Maine, and Stanford University near Palo Alto, California, as well as for The Lawrenceville School; and Montebello Park in St. Catharines, Ontario. In Chicago his projects include: Jackson Park; Washington Park; the Midway Plaisance for the 1893 World's Columbian Exposition; the south portion of Chicago's "emerald necklace" boulevard ring; and the University of Chicago campus. In Washington, D.C., he worked on the landscape surrounding the United States Capitol building. The quality of Olmsted's landscape architecture was recognized by his contemporaries, who showered him with prestigious commissions. 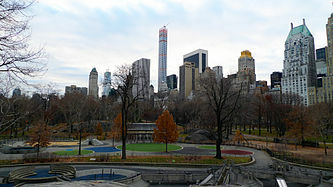 Daniel Burnham said of him, "He paints with lakes and wooded slopes; with lawns and banks and forest-covered hills; with mountainsides and ocean views ..." His work, especially in Central Park in New York City, set a standard of excellence that continues to influence landscape architecture in the United States. He was an early and important activist in the conservation movement, including work at Niagara Falls; the Adirondack region of upstate New York; and the National Park system; and though little known, played a major role in organizing and providing medical services to the Union Army in the Civil War. Olmsted was born in Hartford, Connecticut, on April 26, 1822. His father, John Olmsted, was a prosperous merchant who took a lively interest in nature, people, and places; Frederick Law and his younger brother, John Hull, also showed this interest. His mother, Charlotte Law (Hull) Olmsted, died before his fourth birthday. His father remarried in 1827 to Mary Ann Bull, who shared her husband's strong love of nature and had perhaps a more cultivated taste. On June 13, 1859, Olmsted married Mary Cleveland (Perkins) Olmsted, the widow of his brother John (who had died in 1857). Daniel Fawcett Tiemann, the mayor of New York, officiated the wedding. He adopted her three children (his nephews and niece), John Charles Olmsted, Charlotte Olmsted (Bryant) and Owen Olmsted. Frederick and Mary had two children together who survived infancy: a daughter, Marion (born October 28, 1861), and a son Frederick Law Olmsted Jr. Their first child, John Theodore Olmsted, was born on June 13, 1860, and died in infancy. Olmsted had a significant career in journalism. In 1850 he traveled to England to visit public gardens, where he was greatly impressed by Joseph Paxton's Birkenhead Park. He subsequently wrote and published Walks and Talks of an American Farmer in England in 1852. This supported his getting additional work. Interested in the slave economy, he was commissioned by the New York Daily Times (now The New York Times) to embark on an extensive research journey through the American South and Texas from 1852 to 1857. His dispatches to the Times were collected into three volumes (A Journey in the Seaboard Slave States (1856), A Journey Through Texas (1857), A Journey in the Back Country in the Winter of 1853-4 (1860)) which remain vivid first-person social documents of the pre-war South. A one-volume abridgment, Journeys and Explorations in the Cotton Kingdom (1861), was published during the first six months of the American Civil War at the suggestion of Olmsted's English publisher. To this he wrote a new introduction (on "The Present Crisis") in which he stated explicitly his views on the effect of slavery on the economy and social conditions of the southern states. My own observation of the real condition of the people of our Slave States, gave me ... an impression that the cotton monopoly in some way did them more harm than good; and although the written narration of what I saw was not intended to set this forth, upon reviewing it for the present publication, I find the impression has become a conviction. Southern civilization was restricted to the wealthy plantation owners; the poverty of the rest of the Southern white population prevented the development of civil amenities taken for granted in the North, he said. The citizens of the cotton States, as a whole, are poor. They work little, and that little, badly; they earn little, they sell little; they buy little, and they have little – very little – of the common comforts and consolations of civilized life. Their destitution is not material only; it is intellectual and it is moral ... They were neither generous nor hospitable and their talk was not that of evenly courageous men. In between his travels in Europe and the South, Olmsted served as an editor for Putnam's Magazine for 2 years and an agent with Dix, Edwards and Co., prior to the company's insolvency during the Panic of 1857. Olmsted provided financial support for, and occasionally wrote for, the magazine The Nation, which was founded in 1865. Andrew Jackson Downing, the charismatic landscape architect from Newburgh, New York, was one of the first who proposed the development of New York's Central Park in his role as publisher of The Horticulturist magazine. A friend and mentor to Olmsted, Downing introduced him to the English-born architect Calvert Vaux. Downing had brought Vaux from England as his architect collaborator. After Downing died in July 1852, in a widely publicized steamboat explosion on the Hudson River, Olmsted and Vaux entered the Central Park design competition together, against Egbert Ludovicus Viele among others. Vaux had invited the less experienced Olmsted to participate in the design competition with him, having been impressed with Olmsted's theories and political contacts. Prior to this, in contrast with the more experienced Vaux, Olmsted had never actually designed and executed a landscape design. They were announced as winners in 1858. On his return from the South, Olmsted began executing their plan almost immediately. Olmsted and Vaux continued their informal partnership to design Prospect Park in Brooklyn from 1865 to 1873. That was followed by other projects. Vaux remained in the shadow of Olmsted's grand public personality and social connections. The design of Central Park embodies Olmsted's social consciousness and commitment to egalitarian ideals. Influenced by Downing and his own observations regarding social class in England, China, and the American South, Olmsted believed that the common green space must always be equally accessible to all citizens, and was to be defended against private encroachment. This principle is now fundamental to the idea of a "public park", but was not assumed as necessary then. Olmsted's tenure as park commissioner in New York was a long struggle to preserve that idea. In 1861 Olmsted took leave as director of Central Park to work as Executive Secretary of the U.S. Sanitary Commission, a precursor to the Red Cross in Washington, D.C. He tended to the wounded during the American Civil War. In 1862 during Union General George B. McClellan's Peninsula Campaign, Olmsted headed the medical effort for the sick and wounded at White House in New Kent County, where there was a ship landing on the Pamunkey River. On the home front, Olmsted was one of the six founding members of the Union League Club of New York. In addition to the above Olmsted helped to raise three colored (African American) regiments in New York City and organized a fair which raised one million dollars for the United States Sanitary Commission. Olmsted worked tirelessly for the Sanitary Commission to the point of exhaustion: "Part of the problem was his need to maintain control over all aspects of the commission's work. He refused to delegate and he had an appetite for authority and power." By January 1863 a friend wrote: "Olmsted is in an unhappy, sick, sore mental state ... He works like a dog all day and sits up nearly all night ... works with steady, feverish intensity till four in the morning, sleeps on a sofa in his clothes, and breakfasts on strong coffee and pickles!!!" His overwork and lack of sleep led to his being in a perpetual state of irritability, which wore on the people with whom he worked: "Exhausted, ill and having lost the support of the men who put him in charge, Olmsted resigned on Sept. 1, 1863." Yet within a month he was on his way to California. In 1863 he went west to become the manager of the newly established Rancho Las Mariposas-Mariposa gold mining estate in the Sierra Nevada mountains in California. The estate had been sold by John C. Fremont to New York banker Morris Ketchum in January of that same year. The mine, for whatever reason, turned out not to be successful; and "[b]y 1865, the Mariposa Company was bankrupt, Olmsted returned to New York, and the land and mines were sold at a sheriff's sale." In 1865 Vaux and Olmsted formed Olmsted, Vaux & Co. When Olmsted returned to New York, he and Vaux designed Prospect Park; suburban Chicago's Riverside parks; the park system for Buffalo, New York; Milwaukee, Wisconsin's grand necklace of parks; and the Niagara Reservation at Niagara Falls. Olmsted not only created numerous city parks around the country, he also conceived of entire systems of parks and interconnecting parkways to connect certain cities to green spaces. Some of the best examples of the scale on which Olmsted worked are the park system designed for Buffalo, New York, one of the largest projects; the system he designed for Milwaukee, Wisconsin, and the park system designed for Louisville, Kentucky, which was one of only four completed Olmsted-designed park systems in the world. For a list of Olmsted designed parks in Buffalo, New York, see Buffalo, New York parks system. Olmsted was a frequent collaborator with architect Henry Hobson Richardson, for whom he devised the landscaping schemes for half a dozen projects, including Richardson's commission for the Buffalo State Asylum. In 1883 Olmsted established what is considered to be the first full-time landscape architecture firm in Brookline, Massachusetts. He called the home and office compound Fairsted. It is now the restored Frederick Law Olmsted National Historic Site. From there Olmsted designed Boston's Emerald Necklace, the campuses of Wellesley College, Smith College, Stanford University and the University of Chicago, as well as the 1893 World's Fair in Chicago, among many other projects. 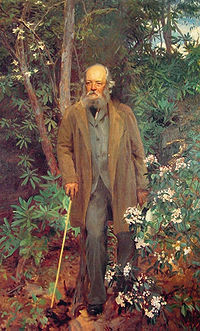 Olmsted was an important early leader of the conservation movement in the United States. An expert on California, he was likely one of the gentlemen "of fortune, of taste and of refinement" who proposed, through Senator John Conness, that Congress designate Yosemite Valley and Mariposa Big Tree Grove as public reserves. This was the first land set aside by Congress for public use. Olmsted served a one-year appointment on the Board of Commissioner of the state reserve, and his 1865 report to Congress on the board's recommendations laid an ethical framework for the government to reserve public lands, to protect their "value to posterity". He described the "sublime" and "stately" landscape, emphasizing that the value of the landscape was not in any one individual waterfall, cliff, or tree, but in the "miles of scenery where cliffs of awful height and rocks of vast magnitude and of varied and exquisite coloring, are banked and fringed and draped and shadowed by the tender foliage of noble and lovely trees and bushes, reflected from the most placid pools, and associated with the most tranquil meadows, the most playful streams, and every variety of soft and peaceful pastoral beauty." In the 1880s he was active in efforts to conserve the natural wonders of Niagara Falls, threatened with industrialization by the building of electrical power plants. At the same time, he campaigned to preserve the Adirondack region in upstate New York. He was one of the founders of the American Society of Landscape Architects in 1898. Olmsted was also known to oppose park projects on conservationist grounds. In 1891, Olmsted refused to develop a plan for Presque Isle near Marquette, Michigan, saying that it "should not be marred by the intrusion of artificial objects." In recognition of his services during the Civil War, Olmsted was elected a Third Class member of the Massachusetts Commandery of the Military Order of the Loyal Legion of the United States (MOLLUS) on May 2, 1888, and was assigned insignia number 6345. Olmsted's election to MOLLUS is significant in that he was one of the few civilians elected to membership in an organization composed almost exclusively of military officers and their descendants. In 1891 he joined the Connecticut Society of the Sons of the American Revolution by right of his descent from his grandfather Benjamin Olmsted who served in the 4th Connecticut Regiment in 1775. In 1895, senility forced Olmsted to retire. By 1898 he moved to Belmont, Massachusetts, and took up residence as a patient at the McLean Hospital, for whose grounds he had submitted a design which was never executed. He remained there until his death in 1903. He was buried in the Old North Cemetery, in Hartford, Connecticut. After Olmsted's retirement and death, his sons John Charles Olmsted and Frederick Law Olmsted Jr., continued the work of their firm, doing business as the Olmsted Brothers. The firm lasted until 1980. Many works by the Olmsted sons are mistakenly credited to Frederick Law Olmsted today. For instance, the Olmsted Brothers firm did a park plan for Portland, Maine, in 1905, creating a series of connecting parkways between existing parks and suggesting improvements to those parks. The oldest of these parks, Deering Oaks, had been designed by City Engineer William Goodwin in 1879 but is today frequently described as a Frederick Law Olmsted designed park. A quotation from Olmsted's friend and colleague architect Daniel Burnham could serve as an epitaph. Referring to Olmsted in March 1893, Burnham said, "An artist, he paints with lakes and wooded slopes; with lawns and banks and forest covered hills; with mountain sides and ocean views." A residence hall at the University of Hartford was named in his honor. Olmsted Point, located in Yosemite National Park, was named after Olmsted and his son Frederick. Drawing influences from English landscape and gardening, Olmsted's principles of design, generally speaking, encourage the full utilization of the naturally occurring features of a given space, its "genius"; the subordination of individual details to the whole so that decorative elements do not take precedence, but rather the whole space; concealment of design, design that does not call attention to itself; design which works on the unconscious to produce relaxation; and utility or purpose over ornamentation. A bridge, a pathway, a tree, a pasture: any and all elements are brought together to produce a particular effect. Olmsted designed primarily in the pastoral and picturesque styles, each to achieve a particular effect. The pastoral style featured vast expanses of green with small lakes, trees and groves and produced a soothing, restorative effect on the viewer. The picturesque style covered rocky, broken terrain with teeming shrubs and creepers and struck the viewer with a sense of nature's richness. The picturesque style played with light and shade to lend the landscape a sense of mystery. Scenery was designed to enhance the sense of space: indistinct boundaries using plants, brush and trees as opposed to sharp ones; interplay of light and shadow close up and blurred detail further away. A vast expanse of greenery at the end of which lies a grove of yellow poplar; a path that winds through a bit of landscape and intersects with others, dividing the terrain into triangular islands of successive new views. Subordination strives to use all objects and features in the service of the design and its intended effect. It can be seen in the subtle use of naturally occurring plants throughout the park. Non-native species planted for the sake of their own uniqueness defeat the purpose of design, as that very uniqueness draws attention to itself where the intention is to enable relaxation: utility above all else. Separation applies to areas designed in different styles and different uses enhancing safety and reducing distraction. A key feature of Central Park is the use of sunken roadways which traverse the park and are specifically dedicated to vehicles as opposed to winding paths designated specifically for pedestrians. A beautiful example of this mix of principles is seen in the Park's Mall in New York's Central Park, a large promenade leading to the Bethesda Terrace and the single formal feature in Olmsted and Vaux's original naturalistic design. The designers wrote that a "'grand promenade' was an 'essential feature of a metropolitan park'"; however, its formal symmetry, its style, though something of an aberration, was designed so as to be subordinate to the natural view surrounding it. Wealthy passengers were let from their carriages at its south end. The carriage would then drive around to the Terrace, which overlooked the Lake and Ramble to pick them up, saving them the trouble of needing to double back on foot. The Promenade was lined with slender elms and offered views of Sheep Meadow. Affluent New Yorkers, who rarely walked through the park, mixed with the less well-to-do, and all enjoyed an escape from the hustle and bustle of the surrounding city. In Erik Larson's The Devil in the White City, Olmsted is featured as one of the most important figures participating in the design of the 1893 Chicago World's Columbian Exposition. In the book, his personality and actions are given significant coverage. In addition, his importance in designing the fair is highlighted (e.g., his part in picking the geographic site and his bureaucratic involvement in planning the fair). In the book The Silent Girls by Eric Rickstad, Olmsted had designed the farm/estate of the wealthy Pratt family. "... the family had hired so-called geniuses to create carriage trails of crushed pink marble, doze earth to mold the rolling hills, and strategically plant thousands of red oaks to replicate some sort of Victorian pastoral aesthetic. These hills had been designed and sculpted by a supposedly famous landscape engineer named Frederick Law Olmsted Senior. The original land had been flat as a beaver tail, scraped smooth by glaciers. The hills and oaks had all been purchased, were a manufactured deception." 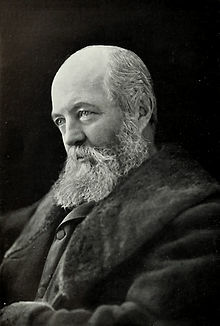 ^ A celebration of the life and work of Frederick Law Olmsted - Biography Page. ^ "F. L Olmsted is Dead; End Comes to Great Landscape Architect at Waverly, Mass. Designer of Central and Prospect Parks and Other Famous Garden Spots of American Cities" (PDF). New York Times. August 29, 1903. Retrieved June 2, 2018. ^ "Firsts". springfield375.org. Springfield 375. Archived from the original on May 21, 2013. Retrieved September 29, 2012. ^ Lewis, William E. (March 2007). "18". Through the Heartland on U.S. 20: Massachusetts: Volume I: A Historical Travel Guide. Publish America. ISBN 9781462624591. Retrieved June 2, 2018. ^ a b Martin, John Stuart (October 1964). "He Paints With Lakes And Wooded Slopes ...". American Heritage. 15 (6). ^ Robert Muccigrosso, ed., Research Guide to American Historical Biography. ^ Martin, Justin (2011). Genius of Place: The Life of Frederick Law Olmsted, p. 8. Da Capo Press. ^ Witold Rybezynski, A Clearing in the Distance: Frederick Law Olmsted and America in the Nineteenth Century, Scribner, New York, 1999. ^ Frederick Law Olmsted; Theodora Kimball Hubbard (1922). Frederick Law Olmsted, Landscape Architect, 1822-1903. G.P. Putnam's Sons. pp. 78–. ^ Cf. Wilson, p. 220. "At the beginning of the Civil War, it was suggested by Olmsted's English publisher that a one-volume abridgment of all three of these books would be of interest to the British public, and Olmsted, then busy with Central Park, arranged to have this condensation made by an anti-slavery writer from North Carolina. Olmsted himself contributed to it a new introduction on The Present Crisis." ^ Olmsted, Frederick Law, "The Cotton Kingdom: A Traveller's Observations on Cotton and Slavery in the American Slave States. Based Upon Three Former Volumes of Journeys and Investigations", Mason Brothers, 1862. ^ a b Filler, Martin (November 5, 2015). "America's Green Giant". New York Review of Books. 62 (17). Retrieved November 8, 2015. ^ Lancaster, Clay (1972). Handbook of Prospect Park. Long Island University Press. pp. 51–66. ISBN 0-913252-06-9. Archived from the original on August 27, 2009. ^ Melvin Kalfus, Frederick Law Olmsted: The Passion of a Public Artist, New York University Press, 1991, pp. 308ff. ^ Masur, Louis P. (July 9, 2011). "Olmsted's Southern Landscapes". New York Times. New York Times Company. Retrieved September 20, 2018. ^ Chamberlain, Newell D. (1936). The Call of Gold: True Tales on the Gold Road to Yosemite. Mariposa, California: Gazette Press. ^ Carla Yanni, The Architecture of Madness: Insane Asylums in the United States, University of Minnesota Press, 2007, pp. 127–139. ^ Laura Wood Roper. "FLO: A Biography of Frederick Law Olmsted". ^ Frederick Law Olmsted, "The Yosemite Valley and the Mariposa Big Tree Grove". ^ Albert Fein, Frederick Law Olmsted and the American Environmental Tradition (1972). ^ Martin, Justin (September 2, 2011). "Jewels of Olmsted's Unspoiled Midwest". The New York Times. ^ 1912 Register of the Massachusetts Commandery of MOLLUS. ^ Yearbook of the Connecticut Society of the Sons of the American Revolution 1897, 1898 & 1899, p. 587. ^ "Olmsted Point". Russ Cary. Retrieved November 16, 2013. ^ "Hundreds Celebrate Completion of Facelift to Yosemite's Dramatic Olmsted Point Overlook". "National Park Service". Retrieved October 16, 2014. ^ Walter Rogers; Michaal Dollin (2010). The Professional Practice of Landscape Architecture: A Complete Guide to Starting and Running Your Own Firm. John Wiley & Sons. p. 19. ^ Kalfus, pp. 196, 313. ^ Rosenzweig, Roy and Elizabeth Blackmar (1992). The Park and the People: : A History Of Central Park. Ithaca: Cornell University Press. p. 133. ISBN 9780801497513. ^ Rickstad, Eric (2014). The Silent Girls. Harper Collins. p. 227. ISBN 9780062351517. Beveridge, Charles E; Paul Rocheleau (October 1998). Frederick Law Olmsted: Designing the American Landscape. New York, New York: Universe Publishing. ISBN 0-7893-0228-4. Guide to Biltmore Estates. Asheville, North Carolina: The Biltmore Company. 2003. Hall, Lee (1995). Olmsted's America: An "Unpractical" Man and His Vision of Civilization. Boston, MA: Bullfinch Press. ISBN 0-8212-1998-7. Rybczynski, Witold (June 1999). A Clearing in the Distance: Frederick Law Olmsted and North America in the Nineteenth Century. New York, New York: Scribner. ISBN 0-684-82463-9. Wilson, Edmund, Patriotic gore; studies in the literature of the American Civil War, New York, Oxford University Press, 1962. Cf. Chapter VI on Northerners in the South: Frederick L. Olmsted. Beveridge, Charles E., ed., Lauren Meier, ed., and Irene Mills, ed., Frederick Law Olmsted: Plans and Views of Public Parks. Baltimore: Johns Hopkins University Press, 2015. xvi, 429 pp. Olmsted, Frederick Law (1856). A Journey in the Seaboard Slave States; With Remarks on Their Economy (1856). Available online from the Internet Archive. Olmsted, Frederick Law (1857). Journey through Texas, or, A saddle-trip on the southwestern frontier: with a statistical appendix. Available online from the University of North Texas. Olmsted, Frederick Law (1861). The Cotton Kingdom: A Traveller's Observations on Cotton and Slavery in the American Slave States (2 Vols.). Available online from the Internet Archive. Olmsted, Frederick Law (1861–1863). U.S. Sanitary Commission reports attributed to Olmsted. CS1 maint: Date format (link) Available online from the Internet Archive. Robert Twombly, ed. (2010): "Frederick Law Olmsted: Essential Texts", WW Norton & Company, New York. Wikimedia Commons has media related to Frederick Law Olmsted. Booknotes interview with Witold Rybczynski on A Clearing in the Distance, October 17, 1999.